the cinderella project: because every girl deserves a happily ever after: Thread Social Summer Sample Sale! 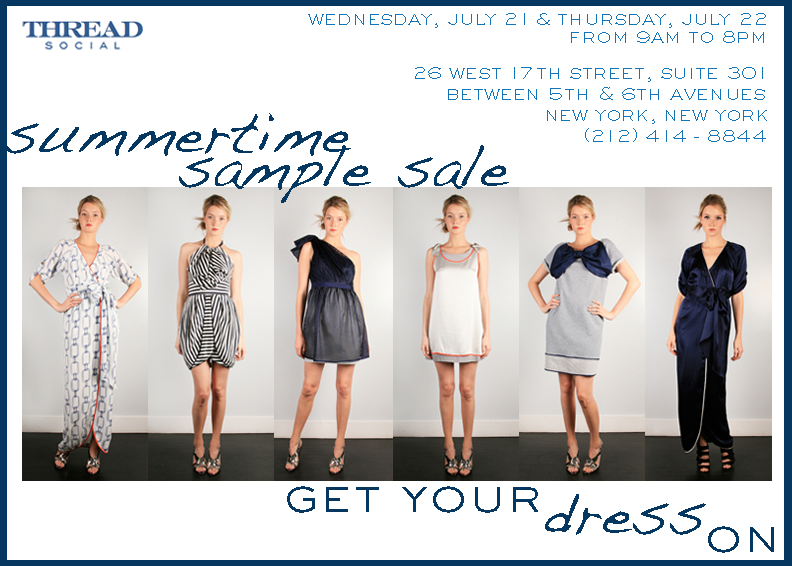 If you didn't get a chance to peruse all the pretties at the Thread Social sale one Gilt, you're in luck because next week is Thread Social's Summer Sample Sale! What can you expect at a Thread Social sale? Rows of highly coveted dresses seen in the glossies like Vogue, Elle, and Harper's Bazaar, just to name a few. This staple of the fashion set is sure to fulfill all your wardrobe needs for every summer wedding, shindig, fête, first date, picnic in the park, rehearsal dinner, and everything in between. And did I mention you can probably coordinate an entire fashion forward bridal party look with said dresses? So get to the sale and let your creativity blossom! For all you ladies unable to take that trip to Thread Social's New York City studios, the lovely ladies will be taking orders via email, web, and phone! Methinks it's a yes to the dress! and that dress, and that dress, and that dress . . . ;). lol! so jealous that i cannot be there!